The Japanese people forever renounce […] the threat or use of force as means of settling international disputes. It goes on to state that “land, sea, and air forces, as well as another war potential, will never be maintained. The right of belligerency of the state will not be recognized”. In the 1950s, the Self-Defence Forces were established, with US backing (but against a backdrop of strong national feeling against militarization). Now a controversial new approach to military legislation has been heralded by Prime Minister Shinzō Abe’s government. 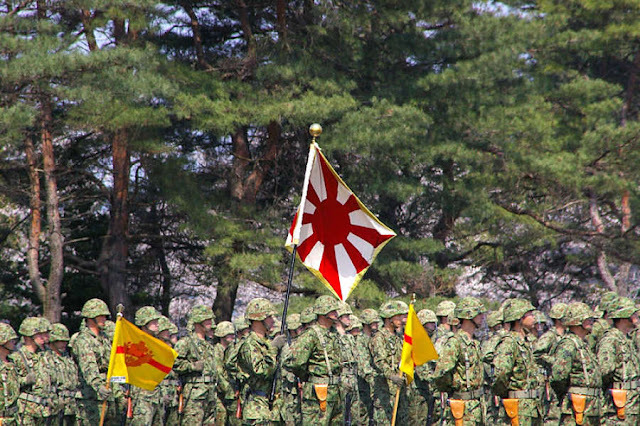 As of March 2016, the Japanese Self Defence Forces are allowed to engage in “collective self-defense” and to come to the aid of an ally under attack. This increase in scope for Japanese military actions overseas has been gained via controversial legislation passed last year and introduced against the wishes of the majority of those polled in Japan and in blatant violation of the Japanese constitution. Given that constitution’s very clear wording, it is perhaps not surprising that the Liberal Democratic Party-led government failed to gain support for a reinterpretation that would allow the collective defense to be operationalised by land, sea and air forces overseas. Even its own appointed constitutional expert ruled that such legislation would be unconstitutional. Despite this, the government used its parliamentary majority to force the bill through parliament. The idea of an apparently increasingly aggressive Japan is now being used as a political tool by commentators, politicians and peace activists. Some are persuaded by accounts of rapid remilitarization, others by claims of over-exaggeration. Either way, in terms of both military capability and intent, any attempt at a comparison between present-day Japan’s foreign policy of “proactive pacifism” and pre-war imperial expansion is not helpful. But the fact that recent developments have been misread as a return to pre-war expansionism does not mean Japan’s current proactivity in its international security role is normal, legal or constitutional. As such, the spotlight needs to be recast upon the current government’s actions. Attention must be drawn to Tokyo’s remarkable reinterpretation of the pacifist constitution, and its subversion of public awareness away from the full-scale of its various military activities. In November 2016, Japanese Self Defense Force (JSDF) troops were again dispatched to the conflict-torn civil-war zone of South Sudan as part of ongoing United Nations peacekeeping operations. Japan’s UN peacekeeping role has been gradually expanded for more than two decades, but this is the first time that JSDF forces are permitted to engage in combat, as part of what could be considered collective self-defence under Abe’s new rules. Japanese troops now sit on the outskirts of Juba, ready to engage in belligerency if it can be framed as self or collective defense. Japan’s first military combat since World War II is now a real possibility. But the particular significance of its wider military presence in and around the Horn of Africa has not been widely examined. In particular, the setting-up and operation of an overseas base in Djibouti have been largely kept away from greater public scrutiny through the subtle use of moderate language and deliberate downplaying of any controversy. Initially described as a “facility” rather than as a military base, air, land and sea-based forces are stationed in Djibouti as part of an active, ongoing and expanding anti-piracy mission in the Gulf of Aden. This offers a means by which Japan can both increase cooperation with alliance partners and potentially further project military power. The increase of Japan’s role in the region, therefore, represents an agenda well in excess of any claim of solely protecting its essential economic security. Japan relies heavily on imports of oil, liquid gas and other vital goods from the Middle East. Closer to home, despite international rulings that reject the legality of Japan fortifying its southwestern island chain with new military bases, these are being constructed throughout the Okinawan islands – for both JSDF and American use. They have also mostly been imposed against local opposition via a judiciary that acts more like an arm of the government than as an independent pillar of constitutional democracy. 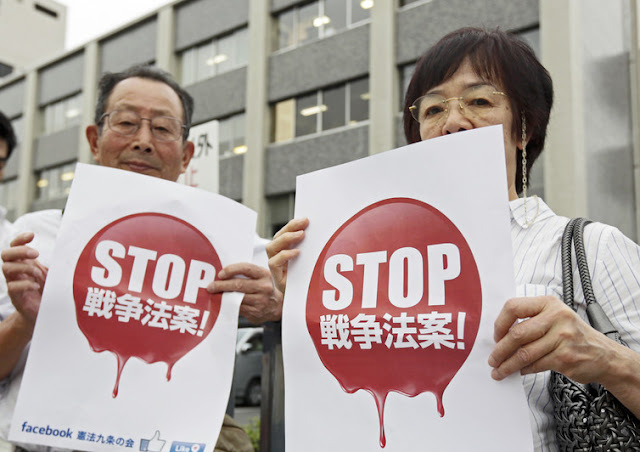 Tokyo’s current security activities all have a recurring, and potentially dangerous theme. They are designed to further integrate Japan’s defense capabilities into those of the US (which imposed the original non-military constitution) and its other allies. All of this is happening at a time when the US, under a Trump presidency, is likely to ask for more from Abe’s government by way of “burden sharing” in the security arena. No matter how base facilities and peacekeeping missions are framed, if circumstances conspire unfavorably, Japan may now be drawn into some form of war-fighting. And as such, if it ever really existed, Japan as a Peace State is surely no more.